Hellifield pele tower is a tower house built in the early 14century. It was much altered during the 15th, 17th, 18th and 19 centuries, with floors and further buildings being added throughout these periods. The original site also had an aisled hall and a tower solar block, but these were both built in the 17th century. A ha-ha (wall faced ditch preventing livestock entering the grounds but affording unbroken views across the park) was built during the late 18th century and a large service wing was also added. Licence to crenellate the tower was granted to Laurence Hammerton in 1440. The tower was at one point surrounded by a wet moat, but no trace of this survives today. During the second world war, Hellifield Pele was used to house German prisoners of war.The site was a roofless ruin, until it bought by a developer, and has been rebuilt for domestic use. The tower lays just off the B6253 south of Hellifield Green. Although the footpath runs very close to it, it is on private property. It was featured in Grand Designs on tv, showing the trials and tribulations that the family went through in owning and rebuilding their dream home. Check out the web site for news and items relating to the pele tower and its new lease of life, as a B&B. 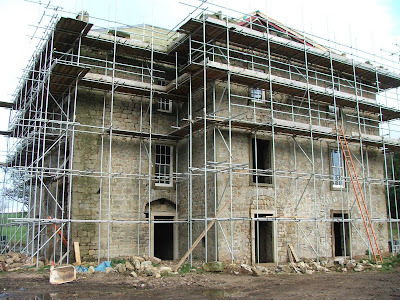 The restoration of this house from roofless and unstable ruin to attractive country house was chronicled in the television programme "Grand Designs" It followed the restoration over 18 months of the house purhcased by a Leeds architect and his wife. The house has been beautifully restored into a very comfortable 7 bedroom house and is a credit to the owner. I wish it was my house. On the Gatehouse Record website, it says 'This site is a scheduled monument protected by law. 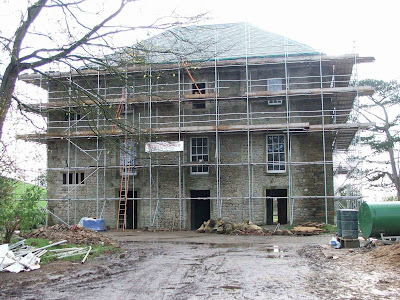 This is a Grade 2 listed building protected by law.' Could you tell me which law? Thanks.